We have used Auxilliary ("Aux") circuit boards for years for our guitar manufacturer customers such as Jackson, Schecter and Ibanez. These boards hold the Sustainiac controls. 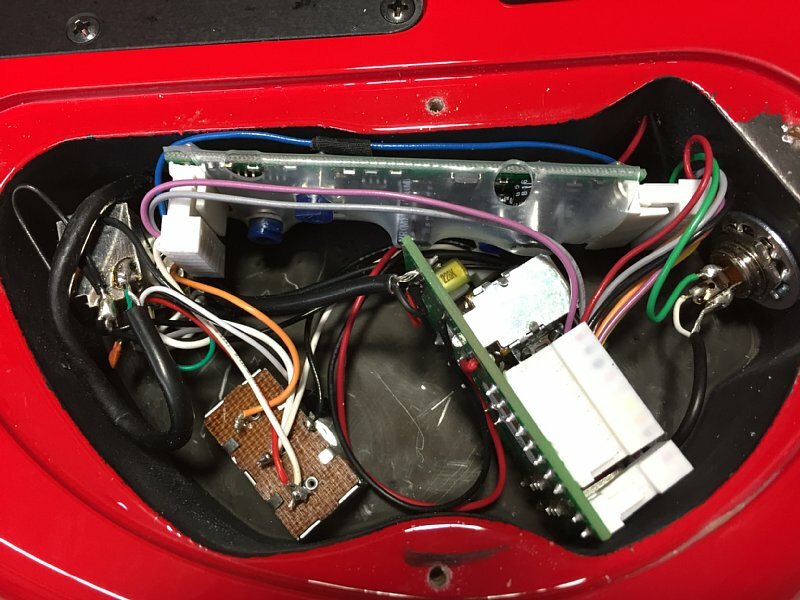 The Aux boards connect to our main circuit boards by pre-wired harnesses. This eliminates much installation labor. It also makes the end product more consistent, and greatly reduces the chance that uncontrolled squealing (oscillation) or "grunge" in the guitar signal due to crosstalk from certain Sustainiac wires to the guitar signal wires. In fact we think this will make the typical Sustainiac installation so much easier and less expensive for our customers that this will become the most popular installation option. Scroll down to see the photos below. We have decided to make this an option in order to reduce the complexity of installing the Sustainiac, and also to reduce the chance of installation errors which sometimes causes frustration with customers and even skilled technicians. As our company Maniac Music Inc. grows with the increasing popularity of the Sustainiac, we have less and less time to answer hundreds of customer calls for help with their Sustainiac installations. Our new "Aux-TT" board with toggle controls sits vertically in the control cavity as shown in the photo of a Jackson DK-2 guitar cavity below. It needs 1.35 inches (35mm) of cavity depth. 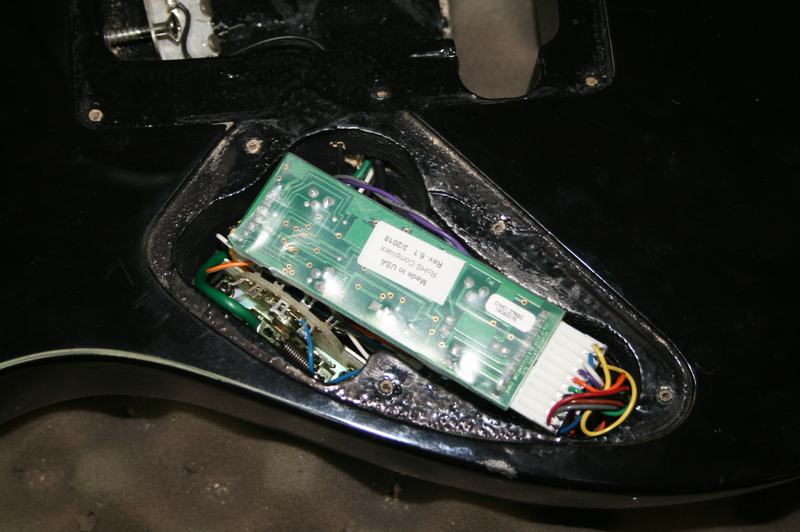 Or, you can eaily modify the cavity depth as shown with the Jackson DK-2 installation below. The new (May 2018) optional Aux boards (Aux-TT, Aux-JS, Aux-2) each add $10 to the Stealth PRO kit price IF you order one INSTEAD of the normal controls and wire harness. Add $25.00 if you want BOTH the Aux board AND normal controls. AT THE PRESENT TIME (2019) WE HAVE NO GOOD AUX BOARD OPTION FOR STRATOCASTERS AND STRAT COPIES, UNLESS YOU REMOVE THE MIDDLE POT. In this case it becomes much like the Ibanez RG, Jem etc. IBANEZ JEM AND SIMILAR RG MODELS: The best Aux board option for this is the Aux-2 board. Sustainiac Aux-2 board mounted to Ibanez RG cavity. 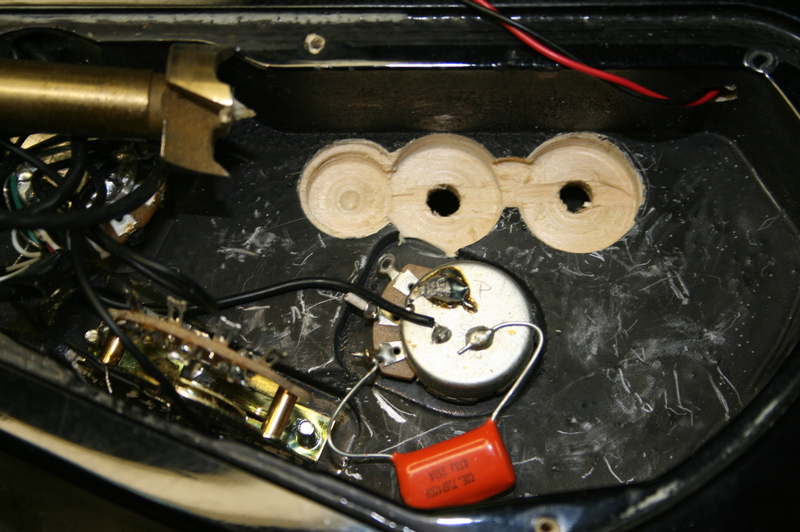 Note how the volume and tone potentiometers have been rotated to make room for the Aux-2 board. 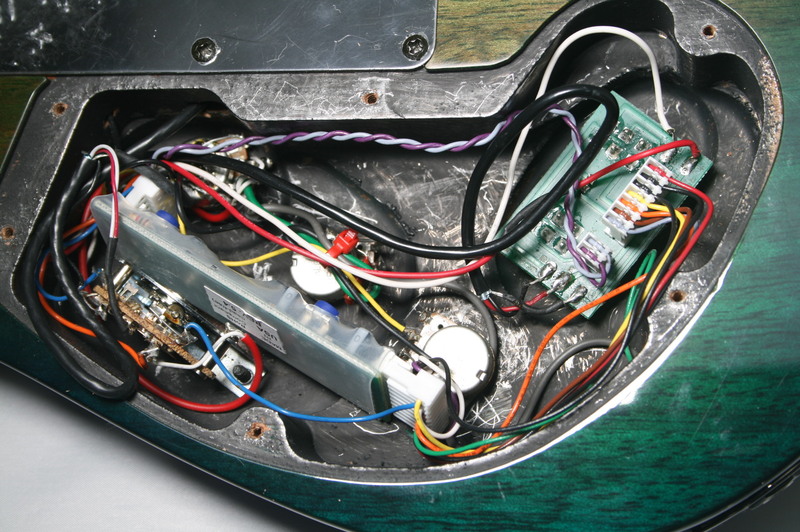 Ibanez RG cavity showing the Stealth PRO circuit board sitting on top of Aux-2 board. There is just barely enough room for everything to fit. But it does! This is a good $10 option for end users to save much time and potential frustration by greatly simplifying the Sustainiac installation. 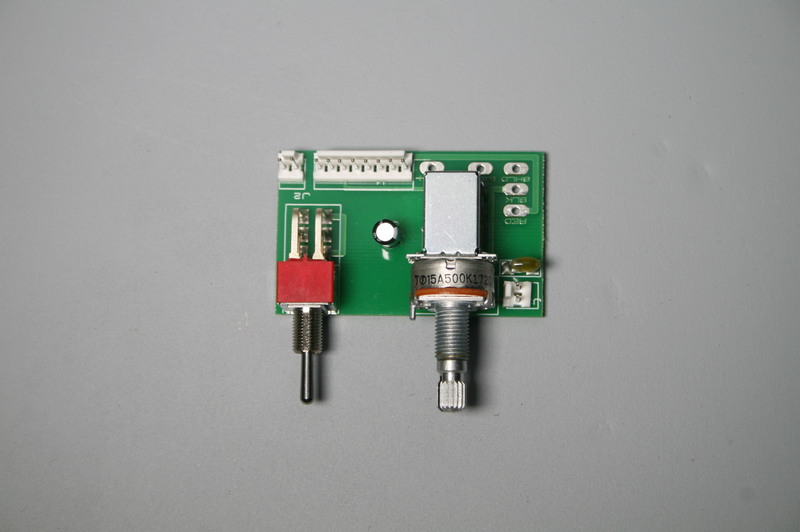 The Aux-TT board is 1.8 in. (46mm) wide x 1.35 in. (35mm) tall. (Requires 1.35 in. (35mm) cavity depth). 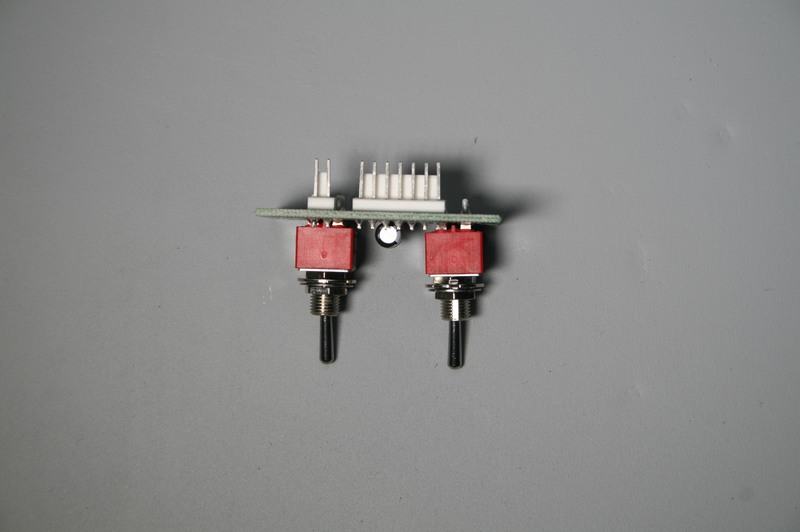 The two toggle switches are spaced 1.00 inches (25.4mm) apart. Jackson DK-2 guitar cavity prep for Aux-TT board, Using a Forstner bit (shown at left in photo) and chisel to make the cavity wall thinner in the switch region. Forstner bits are very easy to control and make a neat cut. 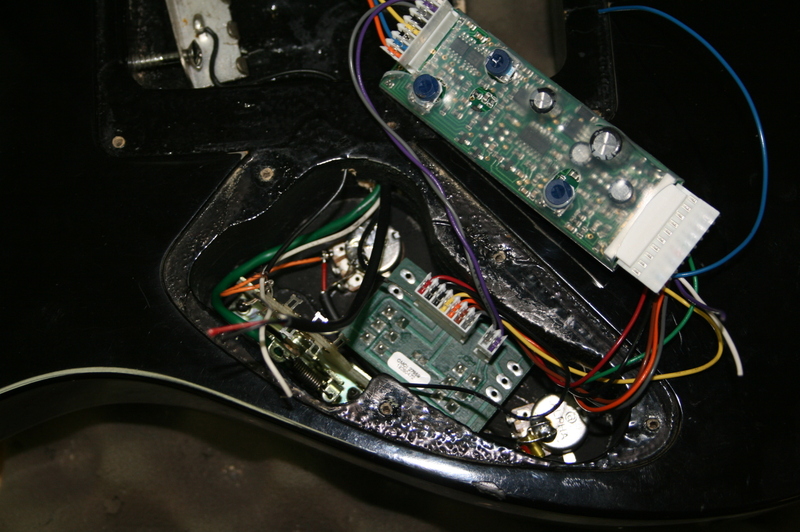 Jackson DK-2 guitar installation using Sustainiac Aux-TT board. Click below to see the following hookup diagram. Compare this to our normal hookup diagrams on our Installation Page to see how much soldering is eliminated with the Aux-TT board. Ibanez JS-2480 guitar control cavity photo. Note that the cavity wall at the top of the photo has to be shaved a little to make room for the Sustainiac circuit board. This can be done in a few minutes with a good hand chisel. 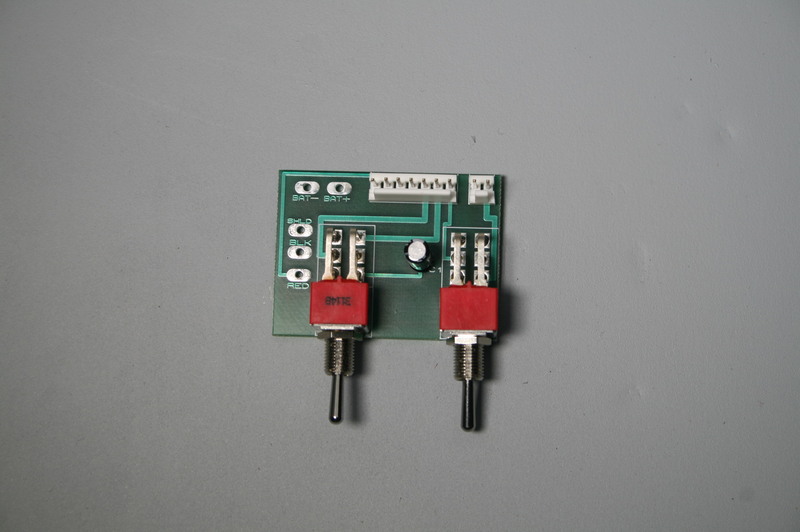 Sustainiac Aux-2 board The Aux 2 board is mounted horizontally to the cavity wall. 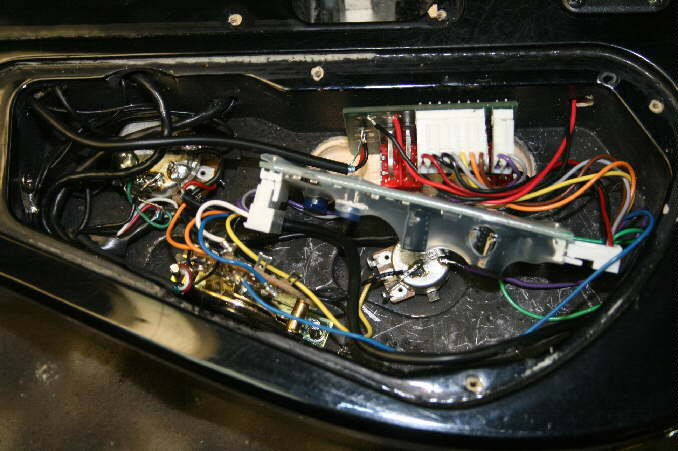 It takes up more room in the cavity than our Aux-TT board. It has been used for years in various Schecter models but we offer it for guitars with roomier cavities. The Aux-2 board also "just fits" into the Ibanez Jem and similar RG models. SEE IMMEDIATELY BELOW. Expect to see other AUX boards in the near future.